The Electrical Experimenter was a technical science magazine that was published monthly. It was established in May 1913, as the successor to Modern Electrics, a combination of a magazine and mail-order catalog that had been published by Hugo Gernsback starting in 1908 The Electrical Experimenter continued from May 1913 to July 1920 under that name, focusing on scientific articles about radio, and continued with a broader focus as Science and Invention through August 1931. The magazine was edited by Hugo Gernsback until March 1929, when the publishing empire of Sidney and Hugo Gernsback was forced into bankruptcy; after that date it was edited by Arthur H. Lynch. There is a post-"Science and Invention" publication, also published by Gernsback, named "Science and Mechanics" and which can be considered the successor to both this magazine and "Everyday Mechanics". 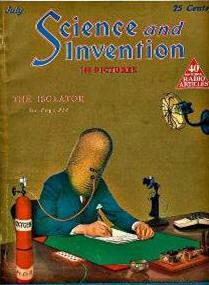 issues of Science & Invention. A continuation may be found in "Science & Mechanics"